Acquired directly from the artist by Harry Torczyner in August 1964. "This is not Magritte," Esquire, February 1966, p. 100 (illustrated in color). D. Sylvester, Magritte, New York, 1969, pp. 13-14 (illustrated in color on the front dust-jacket). D. Larkin, ed., Magritte, London, 1972 (illustrated in color on the cover). A.M. Hammacher, Ren Magritte, New York and London, 1974, p. 41, fig. 43 (illustrated). H. Torczyner, Magritte: Ideas and Images, New York, 1977, p. 170 (illustrated). "The Apple of His Eye," Town and Country, vol. 135, no. 5014, June 1981, p. 128 (illustrated in color). U.M. Schneede, "Rene Magritte: 'die Malerei ist eine Kunst Denkens,'" Art: das Kunstmagazin, October 1983, p. 32. G. Melly, "The World According to Magritte," Sphere, vol. 3, no. 1, January-February 1985, pp. 14-25 (illustrated in color on the cover). P. Gimferrer, Magritte, Paris, 1986, pl. 126 (illustrated in color). "L'avocat aux vingt-cinq Magritte," Supplment Arts du Figaro Magazine, no. 476, 12 May 1989 (illustrated in color). Letter from R. Magritte to A. Bosmans, 29 July 1964, in R. Magritte (F. Perceval, ed. ), Lettres Andr Bosmans 1958-1967, Paris, 1990, p. 364. D. Sylvester, Magritte, The Silence of the World, New York, 1992, p. 29 (illustrated in color). Letter from H. Torczyner to R. Magritte, 28 June 1963, in H. Torczyner, L'ami Magritte: correspondance et souvenirs, Antwerp, 1992, no. 281. Letter from R. Magritte to H. Torczyner, 2 July 1963, in H. Torczyner, L'ami Magritte: correspondance et souvenirs, Antwerp, 1992, no. 282. Letter from R. Magritte to H. Torczyner, 13 August 1964, in H. Torczyner, L'ami Magritte: correspondance et souvenirs, Antwerp, 1992, no. 340. H. Torczyner, L'ami Magritte: correspondance et souvenirs, Antwerp, 1992, p. 19 (illustrated in color), p. 284 (illustrated), pp. 290, 351. B. Schiff, "The artist who was master of the double take," Smithsonian, vol. XXIII, September 1992, pp. 50-51 (illustrated in color). J. Meuris, "Magritte scrut par Sylvester et quelques autres," La libre Belgique, 14 October 1992, p. 26 (illustrated). H. van Nieuwenhove, "Le domaine enchant de Harry Torczyner," Style, no. 9, December 1992, p. 29 (illustrated in color). D. Sylvester, S. Whitfield and M. Raeburn, Ren Magritte, Catalogue Raisonn, London, 1993, vol. III (Oil Paintings, Objects and Bronzes 1949-1967), pp. 400-401, no. 999 (illustrated, p. 400). R.M. Jonger, Ren Magritte ou La pense image de l'invisible, Brussels, 1994, p. 98. R. Magritte, Magritte/Torczyner: Letters Between Friends, New York, 1994, p. 99 (illustrated). H. Haddad, Magritte, 1996, p. 134 (illustrated). Kunstsammlung Nordrhein-Westfalen, Ren Magritte: Die Kunst der Konversation, Dusseldorf, 1996, p. 73 (illustrated in color). 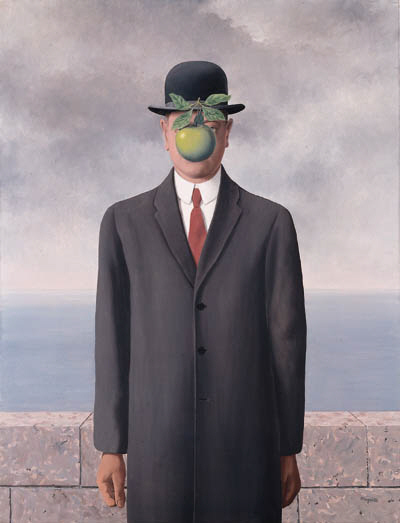 London, Arts Council of Great Britain (Tate Gallery), Magritte, February-March 1969, pp. 14 and 124-125, no. 98 (illustrated in color, p. 125). New York, Sidney Janis Gallery, Magritte, December 1977, no. 27 (illustrated). Brussels, Palais des Beaux-Arts, and Paris, Muse National d'Art Moderne, Centre Georges Pompidou, Rtrospective Magritte, October 1978-April 1979, no. 174 (illustrated; illustrated, p. 47, fig. 1). New York, The Metropolitan Museum of Art, Magritte, September-November 1992, no. 124 (illustrated in color). According to Sylvester and Whitfield, Magritte in fact only discovered a solution to this problem in April 1964 when he made the gouache Le got de l'invisible (fig. 1); Magritte did not initially conceive of the gouache as a self-portrait, but soon realized it provided the perfect imagery for Torczyner's commission. Magritte had completed Le fils de l'homme by the time of Torczyner's visit to Brussels in the last week of July 1964. Torczyner received the painting in New York before 13 August when he wrote to Magritte to announce its safe arrival. Four earlier oil paintings by Magritte have been identified as self-portaits: Tentative de l'impossible, 1928 (Sylvester, no. 284; Galerie Isy Brachot, Brussels); La lampe philosophique and La clairvoyance, 1936 (Sylvester, nos. 399 and 419; private collections); and Le sorcier, 1951 (Sylvester, no. 766; Galerie Isy Brachot, Brussels). In addition, Le thrapeute (lot ???) may be a kind of self-portrait, since Magritte posed for a photograph based on the picture (see lot ?? ?, fig. 1). It is striking that the titles of all these paintings refer to magical powers. Throughout his career Magritte repeatedly emphasized his fascination with the shamanistic force of art. For example, in his famous lecture La ligne de vie, delivered in 1938, he stated that he was attracted to art as a child because "painting seemed to me magical and the painter to be gifted with superior powers" (quoted in ibid., vol. II, p. 68); and he also said that in art "it is the power of enchantment which matters" (quoted in S. Gablik, Magritte, New York, 1985, p. 172). Le fils de l'homme is the most enigmatic and mysterious, the most haunting and magical of all his self-portraits. Magritte appears to have thought very highly of Le fils de l'homme. He even imitated it in three portrait photographs made in the mid-1960s (figs. 2-4). (fig. 1) Ren Magritte, Le got de l'invisible, 1964. Zen International Fine Art, Tokyo. This painting has been requested for the exhibition Magritte: Precursor of Conceptual Art, to be held at The Louisiana Museum of Modern Art, Humlebaek and traveling to Edinburgh, National Gallery of Art, August 1999-early 2000.